Across Possession Bay(1995) by Mike Skidmore. Original oil on canvas painted of 1969 view framed next to overpaint of digital image of the same view in 2009. Beautiful painting showing glacial retreat at South Georgia. Original oil on canvas painted in 1969. View framed next to overpaint of digital image of the same view in 2009. 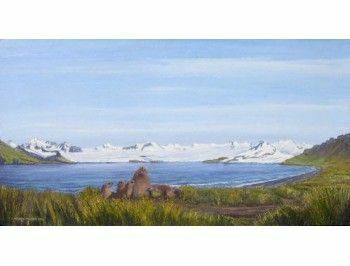 Beautiful painting showing glacial retreat at South Georgia.